OLEVIA TV remote codes. If you need the remote codes for your OLEVIA TV to control it with a universal remote control, these codes will operate your OLEVIA TV. We have 4 and 5 digit codes below for your TV that are working. If the first does not work keep trying the codes down the list. 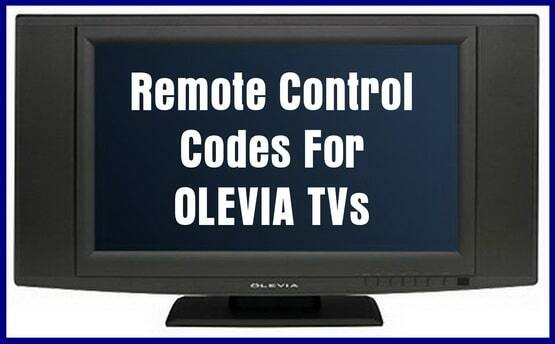 Need help with more OLEVIA remote codes or setting up your remote with your Olevia TV? Please leave a comment below. Thank you very very much, the second code did it for my tv! I’m saving your site in my bookmark! Please I forgot password need it how can I open tv with out it? I followed your instructions and the remote only turns the TV off and not on again. Try using a different remote code in the list above. I have the same issue and tried all the codes. Only one works 11610 and the control only turns off the tv but not on again. Any other suggestions? I have a rca rcu410rs universal remote will it work on OLEVIA. I also have a radio shack family favorites 4n1 15-214. Do they work together and what are codes for 42 inch OLEVIA LCD model 242TFHD? Codes did not work for my Olevia TV using a Sony RM-V10 universal remote. Cannot figure out remote code for new Olevia remote control 32 inch TV. THanks! Nine of the codes listed for my brand TV are working for my new Xfinity remote!